Realtor In Tempe: Where To Invest Your Money: Real Estate Or The Stock Market? 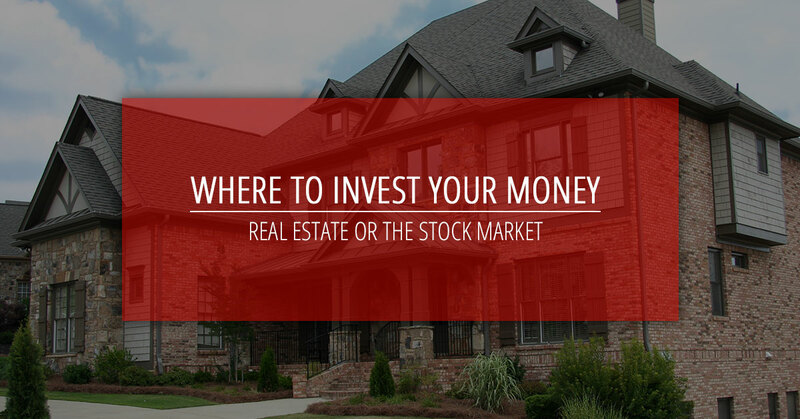 There are many different ways a person can invest money, but most people choose to follow one of two avenues: invest in the stock market or in real estate/investment properties. There are pros and cons to both types of investment, but the benefits of investing in real estate significantly outweigh the benefits of investing in the stock market. According to a study done by Better Homes and Gardens® Real Estate, 89 percent of investors choose to put their money into real estate, and 96 percent of those investors explain their decision helped them achieve financial success. These successes included greater overall financial stability, greater long-term net worth and greater monthly cash flow. We understand that determining where to invest your money is a big decision—if you would like to learn more about investing in real estate, continue reading below and get in touch with the professional realtors at Schreiner Realty serving Gilbert, Mesa, Chandler and Tempe. You will see an immediate cash flow. When you decide to invest in real estate, choosing and/or creating a property with a positive cash flow is of the utmost importance. If you are turning your new investment property into a rental, this route is the best way to collect an immediate return on your investment. At the beginning of every month, a cash flow will occur when you subtract your mortgage payment from the monthly rent you are charging your tenants. For example, if your monthly mortgage is $1,500 and you are able to charge tenants $2,000 each month, you will see a profit and your monthly mortgage payment is being paid by someone else, thus building equity in the home. Make sure you do your research to find out the rental rate market, property management fees and any other expenses tied to an investment property. And remember to talk to a tax professional about the deductions you may be eligible for with an investment property. Investing in the stock market usually means a much smaller return that can go unnoticed for months. In many cases, the profit is not even realized until the stock is sold and the return is only around five percent, compared to real estate investors who are used to seeing a minimum 15 to 20 percent return on investment. When you invest in stock, there is really no immediate ROI, meaning a longer time for you to wait before seeing your money. You will avoid emotional buying and selling. Emotional buying and selling is an extremely common trend in the stock market. The stock market is known for its frequent and unpredictable (usually) fluctuations—these kinds of sudden changes evoke reactions from anyone who has invested in stock and is worried about the status of their money. This turns into emotion-based, rather than logic-based, decision making, such as buying or selling stock at the wrong times. Even financial advisors can make mistakes and offer improper recommendations, which can result in loss for investors. In 2007, the stock market had dropped by 50 percent. Many financial advisors told clients to sell stock, when they instead should have been advising the clients to buy stock. Experienced investors typically aren’t phased by fluctuations in the stock market, but they are experts who have seen how the price of stock can rise and fall. New investors, however, tend to panic when the price of their stock goes down, resulting in emotional buying and selling. Yes, it is true that the real estate market can fluctuate as well, but most times, these changes are predictable—this means you will have ample time to adjust and plan ahead, unlike the stock market where calculating trends is much more difficult, if not impossible. When you invest in real estate, you have complete control over your money and your investment. You will be the person who makes the decisions that influence your ROI. Real estate is a tangible investment. When you invest in real estate, you are purchasing a physical property. Unlike stock, you will have hands-on access to your investment. If you need to check up on the property, you can. If you feel like renovating or want to upgrade your appliances, you can. If your tenants call at midnight because of a burst pipe, you can handle the problem promptly and in person. You can manage your investment anytime and in any way you would like. For many people, this is one of the biggest benefits of purchasing an investment property. If you choose to invest in the stock market, you are essentially paying to “own” a piece of a company. The people who run the company are the ones in charge of your money, and they make the decisions that they hope will we be most profitable for everyone. In this sense, you have very little control over your money. You also lose control of your investment because variables that influence the stock market are entirely out of your hands. Many people feel worried and on edge when they have no real, tangible evidence of their investment. Sure you can follow the stock market and relevant trends, but beyond numbers on a screen, what do you have to show for your financial contribution? Where is your money, and who is deciding what to do with it? At Schreiner Realty, we believe that you should have control over your investment at all times. It is your hard earned money, and you are the one person who should be in charge of it. You can invest for little to no money down. Investing in real estate really couldn’t be easier—especially because you can start investing for little to no money down. With all of the financing options and available loans for homebuyers, you may be able to purchase a $275,000 home for $0 out of pocket. Make sure to thoroughly research the mortgage that best fits your financial situation and then get to calling Schreiner Realty to help you purchase your new investment property! Choosing to put your money into real estate once agains gives you complete control over your investment, your money and your mortgage. When someone invests in the stock market, there is an option to purchase stock on margin. This is an extremely risky financial decision, however. The following is an example of buying stock on margin. Tomorrow, you decide you want to buy $50,000 in stock. Unlike investing in real estate, you must put money down right away to purchase stock—in this example, you will need $25,000 in cash to move forward buying. For many, a large, up-front cash investment like this is out of the question. Even investing less money comes with enormous risk. Why? If your stock loses value, a trading company can ask you to pay the margin due right then and there. Will you be in a place, financially, where you could easily pay the margin due without any forewarning? Companies also have the right to sell your stock if the price drops too low. So, not only will you have to put a large chunk of money into your investment right off, you will again find yourself with very little control over what happens to your money. The risk is simply too high when it comes to investing in the stock market. Real estate is much easier to value. When you decide to partner with the team at Schreiner Realty, we will be by your side for every step of the buying or selling process. We have unlimited resources to help you calculate the value of the investment property you are looking to purchase, so that you know exactly how much you are going to pay for your tangible investment. You have a clear idea of how much money you are putting into your property and can then calculate your financial goals moving forward with your investment. The stock market, again, is full of too many “unknowns.” If you don’t have access to helpful resources or to people who are extremely well-versed in all aspects of the stock market, it will be almost impossible for you to value the billion dollar company you are considering investing in. Truly, it is only the owners and managers of that company that understand what is really happening with their business, financially. You have the opportunity to team with Schreiner Realty. If you have recently enlisted our professional services to help you purchase an investment property in Gilbert, Chandler, Mesa or Tempe, we hope you enjoyed your experience with our team of professional realtors. If you have yet to get in contact with the Schreiner Realty team, give us a call today! We have extensive realty knowledge and can provide you with information about the city and neighborhood you are moving to. If at any point you have questions or are in need some help, we are here for you—your happiness is our priority! So if you are ready to invest in an Arizona property and are looking to work with the most professional and experienced realtors serving Gilbert, Chandler, Mesa and Tempe, get in touch with our team today!